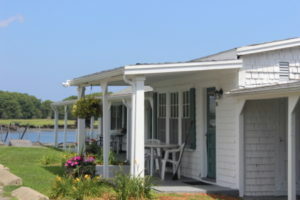 The Essex river slowly winds its way through the salt marshes that surround Shea’s Riverside Inn & Motel, inviting you to stop and stay a while. We offer unbeatable accommodations in Essex, MA and welcome both business and leisure travelers from around the world. Please click the images below to see the rooms in either building. The Inn is an 18th century colonial that was recently renovated and given a new life as the most luxurious place to stay in Essex. 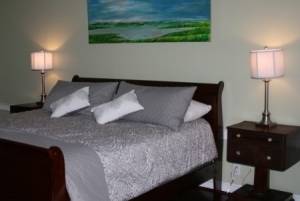 This 6 room Inn has retained all of its original charm. From hardwood floors to inviting sitting areas, each room is perfect for visitors in the area for business or leisure travel. Sorry folks, The Inn is not dog friendly but we do welcome your furry friends in select rooms in The Motel. The Motel is a 15 room property that just couldn’t be more delightful! As the last single level motel on Cape Ann, this lovingly maintained building instantly transports you to a simpler time. We welcome you to bring your dog along for your trip (in select rooms only), and offer a variety of bed configurations to best fit your family’s needs.